Bamboo knife block for sales or for customer to make up a gift set with cermaic knives. 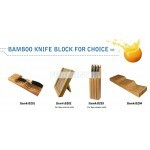 All the type and style are selected and produced by our bamboo product factory,we offer all kitchen releated products. More new products continue to be updated here. Here we show hot sales Bamboo knife blocks for you.Please feel free to let us know what you need from them or if you have any idea about the products.